LG has always been a respected supplier of premium monitors, aiming to deliver a high specification rather than a rock-bottom price. It continues to target this market with the L1932P, a 19-inch display with a top resolution of 1,280 by 1,024. The display has a classic look, with a slim, silvered surround and a small indicator LED in the shape of a smiling mouth, which shines blue when on and yellow during stand-by. Controls are a set of four buttons under the bottom lip of the screen that give easy access to the automatic and manual setup options. The monitor has analog and DVI inputs and, as always, you should use the digital input if your graphics adaptor supports it. The base of the stand is a turntable, so you can swivel the screen round to any angle you might desire - a much more flexible approach than having just a ball-joint mechanism at the top of the pedestal. You can tilt the screen, of course, and it's nicely counterbalanced on the stem of the stand. This all means you can adjust it to get the screen top anywhere from 450mm to 540mm above the desktop. The screen also supports rotation. Thanks to the supplied copy of Portrait Display's Pivot Pro software, you can just turn the screen physically through 90 degrees, and the Windows desktop flips from landscape to portrait to follow suit. 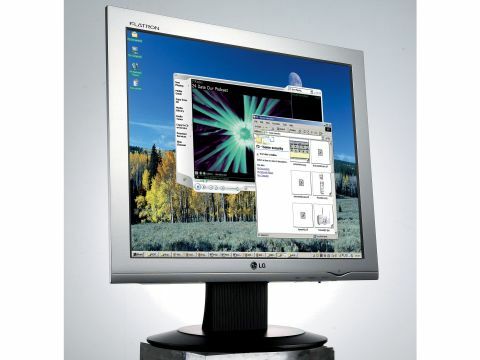 This is very convenient, and ideal if you'll be using the monitor for DTP or web design. Running the DisplayMate suite of visual tests on the monitor shows the L1932P to be as sound technically as it is versatile in use. The colour spread is good and the greyscale swatches are all visible, meaning its white level response is wide. The supplied ForteManager software, which handles calibration when the screen is run using the analogue input, is easy to operate and one of the reasons for the strong results.